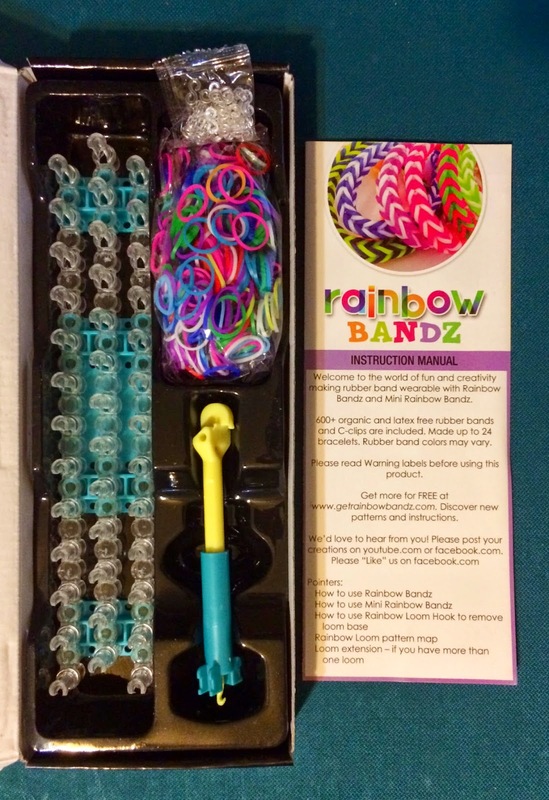 Have your kids caught the Rainbow Bandz craze? I know both of mine have. My son was taking dibs on this kit as soon as it arrived because his sister already had two sets she got for Christmas last year. And of course as I'm sure you can guess she wasn't doing a very good job of shareing with her big brother. I like this kit because it has a nice box that keeps everything nice and compact inside. The instruction manual is easy to follow and even tells you where you can go to get more patterns online for free! Definitely a plus because it doesn't take long for my kids to figure out things and want something more complex and advanced. It's very easy to use and so far everything has worked great and nothing has broken. Kit Includes: 24 C-clips, Hook, Loom, Instruction Manual, and 600 latex-free mixed color rubber bands.